Each leasing company has their own preferred contract forms, layouts and specific way to break down the sections of their leasing contracts. However, by law, all leasing contracts must contain certain important elements. This is the most important part of the leasing agreement, as it spells out how much you are paying and what you are paying for. All leases are required to disclose your monthly payment, as well as how it was calculated. The amount due at the start of the lease is also required to be listed on your leasing contract. It is important to review this section, as some of the less honest dealers may negotiate the entire purchase without mentioning some fees, such as the acquisition fee, and spring them on you after you’ve already signed the contract. The leasing contract is also required to disclose both the total payments you will make over the course of the lease, as well as the total amount of finance charges that you will pay over the period. Based on this information, it is possible to figure out the money factor that was used for the lease, since that does not have to be disclosed in the leasing agreement, and most leasing companies choose not to list it. They do, however, have to disclose how the monthly payment was calculated. You can also learn how lease payments are calculated in the next section of this guide. The list of payments and charges also needs to include all of the fees and other charges that you will be subject to over the normal execution of the lease. That includes things such as the disposition fee and the mileage penalty, but the contract does not necessarily have to list fees for non-standard options. For example, you will rarely see the fees for the early termination of a lease on your leasing paperwork. Just like when you are financing a car, you are required to maintain a relatively high level of insurance for the vehicle that you are leasing. You are required to have both liability insurance - for when you hit another car, injure someone, or cause property damage, as well as comprehensive and collision insurance for damage to the car that you are leasing. If you do not have both of those types of coverage or do not meet their minimum coverage amounts, then you are in violation of your leasing agreement and could face penalties. The comprehensive and collision insurance required by most leases is equal to the value of the car itself. The minimum liability insurance coverage, on the other hand, can vary significantly between leasing companies. Some are fairly lenient, and require minimum coverage that is less than the legal requirement in many states. Others can be fairly strict and require high insurance minimums. Be sure to read this section of your leasing contract carefully and compare it to your current levels of insurance coverage. Leasing companies are not required to offer gap insurance coverage, but if the lease includes either gap insurance or a gap waiver as part of the deal, then that information will be listed in the contract itself. It is something to look out for, as gap insurance can protect you from some hefty costs should your leased car end up totalled in an accident. As part of a lease, you are expected to drive less than a specified amount of miles over the duration of the lease. All leasing contracts are legally required to list these requirements as well as how penalties are assessed for the failure to do so. That is fairly straightforward process. The leasing contract will list the total amount of miles that you are not expected to exceed over the course of the lease. That number can also be expressed as an annual mileage. For example, if your lease is for 12,000 miles per year and you are leasing your car for 30 months, then your total mileage for the lease is expected to be less than 30,000 miles. The contract will also list the penalty that you will pay should your car be over the mileage when it is returned to the dealership. Those penalties are expressed in dollars per mile, and usually fall somewhere between $0.15 and $0.5 per mile. That makes it easy to calculate how much your over-mileage charges will be if you are over. In many cases, you will have the option to buy additional miles at lease start at a slight discount, though that is rarely worth it as compared to simply choosing a higher mileage lease. In addition to limiting the amount of miles you drive, a lease contract also stipulates that you are expected to maintain your car and good condition and that the car will not have damage to it beyond normal expected wear and tear. The leasing contract is required to have a section outlining exactly what is considered normal wear and tear on their vehicle, and the kind of condition that they expect the car to be at the end of the lease. They do vary slightly from leasing company to leasing company, but for the most part are fairly generous. Smaller scratches or chips, wear on the fabric or slightly worn tires are usually not a problem. You will, however, be charged for larger repairs or significant damage to either the interior or the exterior of the car. It is important to pay close attention to this part of your leasing agreement, as it will help you understand what is expected of you for the duration of the lease. It is also here that you will find conditions related to smoking or keeping pets in your car, which can be against the rules for some leasing companies. All leasing contracts must include information about the conditions of early lease termination and how it works. Different leasing companies do this differently, but some common conditions include prohibiting you from ending the lease too close to either the start or end date. There will also be information about how the value that you owe on your lease - the payoff amount - is calculated. Early termination may also be subject to additional fees. Unlike other fees, the leasing company is not actually required to list those fees on the leasing contract, so it is a good idea to research those ahead of time. This can be especially important if you have to terminate the lease early because you were in an accident and the leased car was declared a total loss by the insurance company. Despite it not being your fault, that still counts as early termination, so this section is important even if you are certain that you will see your lease through to its end. How lease payments are calculated is something that car dealerships have tried to keep from the customers in order to make it more difficult to negotiate lease terms. At many dealerships, the sales staff and even some managers don’t know how to calculate monthly lease payments, simply getting them from a computer program or the dealership’s finance officer. However, there is nothing particularly difficult involved in calculating the lease payment. In fact, the math is even easier in a lease than it is when calculating finance payments! This part of the guide will show you how to calculate your lease payment, as well as how to reconstruct key values like the net capitalized cost, the residual value and the money factor from the numbers you are given. This will help you be a fully informed consumer and get a good deal on your next lease. The lease payment primarily consists of two parts: the depreciation payment and the finance charge. There is a third component as well - the sales or use tax, but how that is calculated for your lease depends on the state in which you are registering your car. The depreciation payment is exactly what it sounds like. You are paying off the amount of value that the car loses while you drive it. It is calculated by taking the net capitalized cost and subtracting the residual value. The net capitalized cost is just the final sale price of the car plus any taxes or fees that are not paid up front, minus any money you put as a down payment or trade-in credit on your previous car. The residual value, meanwhile, is a percentage of the car’s MSRP or list price. You then get your monthly depreciation payment by taking the difference between the net capitalized cost and the residual value and dividing it by the amount of months that you are leasing the car. Example: You are purchasing a car with an MSRP of $30,000, but have negotiated the price down to $25,000. The term is 36 months and the residual value is 55%. Other fees add up to $1,500, and you are rolling them all into your payment. The finance charge is also relatively simple to calculate, though it requires knowing the money factor that is used. In this case though, you add the net capitalized cost and the residual value together and multiply them by the money factor. That is your monthly finance charge payment. Finance charges are effectively the bank’s fee for giving you the money to buy the car up front, in the same way as interest when you take a bank loan. The net capitalized cost is the amount of money the leasing company gives the dealer up front to purchase the car, while the residual value is money that they can’t access until the end of the lease. For that reason, both are subject to the finance charges. Example: The money factor on your leased vehicle is 0.00240. To get the equivalent interest rate, we can multiply it by 2400, for an interest rate of 5.76%. The net capitalized cost, from the previous example, is $26,500. The residual value is $16,500. The total amount is $26,500 + $16,500 = $43,000. The monthly finance charge is $43,000 x 0.00240 = $103.20. The total lease payment, excluding taxes, in this case is $277.78 + $103.20 = $380.98. How you pay your sales tax depends on the state in which you decide to register your leased vehicle. Most states provide a tax benefit for leasing by waiving the normal sales tax that you would pay for a new car. Instead, you pay a monthly use tax that is equivalent to the sales tax rate. In order to find out how much tax you will pay on your lease, simply take your lease payment and multiply it by the sales tax percentage to get your monthly tax payment. Example: The monthly payment for the lease used in the example above is $380.98. If the sales tax is the state is 6.25%, then the tax on each payment is $380.98 x 0.0625 = $23.81. That means that your total payment is $380.98 + $23.81 = $404.79. There are, however, several states that do not follow this formula. In those states, you have to pay the sales tax up front at the start of the lease, though how it is calculated varies. In some states, such as Texas and New York, you pay the same tax as you do when you purchase or finance a vehicle. That is calculated by multiplying the state tax rate by the sale price of the vehicle. You can choose to either pay that amount up front, or roll it into your payments. In the later case, you can calculate your payment by adding the amount of tax to your net capitalized cost, and calculate the finance charge and depreciation charge based on that. Example 1: You decide to pay the amount of your sales tax up front on the lease from the above examples. The sale price of the car is $25,000. The tax rate is 6.25%. That means that the total sales tax on the vehicle is $25,000 x 0.0625 = $1,562.50. That would be the amount of tax paid at the signing of the lease. Example 2: You decide to roll your tax payments into your monthly payments. In the example above, your net capitalized cost is $26,500. Adding the sales tax to this gives the new net capitalized cost of $26,500 + $1,562.50 = $28,062.50. That makes the new depreciation monthly payment ($28,062.50 - $16,500) ÷ 36 = $321.18. The finance charge is ($28,062.50 + $16,500) * 0.00240 = $106.95. That makes the total payment, including tax, of $428.13. In other states, such as New York and Ohio, the sales tax is on the sum total of the lease payments that you make. In order to calculate that, you simply add up all of your monthly payments and then multiply the result by the tax rate. In these states, it is impossible to roll your tax into the monthly payments, since that would also change the amount of tax that you would pay. Example: The monthly payment, without including tax, in the previous example is $380.98, over the course of 36 months. The total payments are $380.98 x 36 = $13,715.28. The tax rate is 6.25%. That makes the tax due at signing $13,715.28 x 0.0625 = $857.21. It is important to note that these are just the most common ways in which states calculate the sales tax on leased vehicles. There is some variation depending on the state where you lease your car. Some states tax the dealer and bank fees, while others do not. Some states consider your initial down payment - the capitalized cost reduction - taxable, while others only tax the monthly payments on the lease. Before leasing, be sure to do research on the specifics of lease tax calculations in your state. In most states, however, one of the four formulas presented above will allow you to calculate the tax on your lease. In order to properly calculate your monthly lease payments and make sure that they match the numbers you have discussed with your sales person, you need to know the money factor. However, dealers and leasing companies alike are often loath to release that information, and it is not one of the elements of the lease that the leasing contract is required to disclose by law. However, the money factor is easy to calculate from the information that the contract is required to disclose. 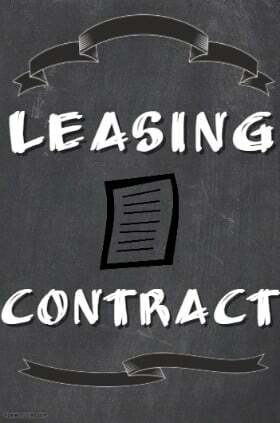 Every leasing contract needs to list the total finance charge. The total finance charge is just the monthly finance charge, as calculated above, multiplied by the amount of months that you are leasing the car. From that, it is possible to calculate the money factor. Divide the total finance charge by the amount of months that the lease lasts, and you will have the monthly finance charge. Then, divide this number by the sum of the net capitalized cost and the residual value to get the money factor. This will allow you to check over the work of the dealership’s finance department to make sure that nothing was changed or missed from your final agreement before you sign. Example: The total finance charge listed in your leasing agreement is $3,715.20, and you are leasing your car for 36 months. The net capitalized cost is $26,500 and the residual value is $16,500. The monthly finance charge is $3,715.20 ÷ 36 = $103.20. The net capitalized cost plus the residual value is $26,500 + $16,500 = $43,000. The money factor is then $103.20 ÷ $43,000 = 0.0024.